← Congrats to Director Gross! 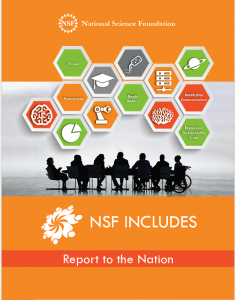 A new National Science Foundation report highlights NIMBioS’ and NISER’s efforts in the “bold, new initiative in broadening participation in STEM” called NSF INCLUDES. One of NSF’s Ten Big Ideas for Future NSF Investments, NSF INCLUDES invests in pilot projects and funds alliances and partnerships that use research-based, collaborative change strategies aimed to broaden participation in STEM. A total of 69 pilot grants were awarded in 2016 and 2017. The grants have been awarded to projects that provide STEM engagement for students and communities to promote STEM studies and careers; enhance support systems for undergraduate and graduate STEM students; strengthen institutional capacity; address students’ STEM identity, attitudes and motivation; prepare STEM educators; address career needs of STEM professionals; and expand access to quality STEM education. The new 24-page NSF INCLUDES Report to the Nation highlights the NIMBioS/NISER conference on Multiscale Evaluation in STEM Education (NSF Award #1650390) held in February 2017. The conference and associated activities taught participants how to develop evaluation plans for NSF INCLUDES projects. It included a pre-conference tutorial on “Modern Methods in Program Evaluation” and a two-day conference. More than 100 participants from across the nation attended. A pre-conference webinar, “Program Evaluation 101,” was attended by more than 100 virtual participants. The hour-long video has been viewed more than 250 times. Continuing its involvement in NSF INCLUDES, NIMBioS/NISER is currently hosting a series of monthly evaluation-focused webinars to help viewers develop evaluation plans that meet the needs of INCLUDES Pilot and Alliance Projects. The free webinars will be of interest to those involved in current or upcoming INCLUDES projects, those considering collaborating in such projects, and STEM educators considering inclusion of formal evaluation in their projects. The next webinar, scheduled for next Thursday, April 2, at 2 p.m. EST, will focus on “Engaging Diverse Populations in Evaluations of NSF INCLUDES Projects.” Past webinars, as well as the webinar slides and the associated chat, may be viewed at http://www.nimbios.org/IncludesConf/webinars. Online registration for future webinars is also available at the link. This entry was posted in conference, evaluation, STEM and tagged conferences, Education, STEM. Bookmark the permalink.